As this picture shows, solar shades can make a room more livable by reducing glare and radiant heat from a sunny window without blocking the view or making you feel like a cave dweller. Solar shades are made from open weave synthetic fabrics with numerous patterns and colors and levels of transparency to choose from. Here’s another photo, this one has a lighter colored fabric. Now for the down side – you knew there had to be one didn’t you? 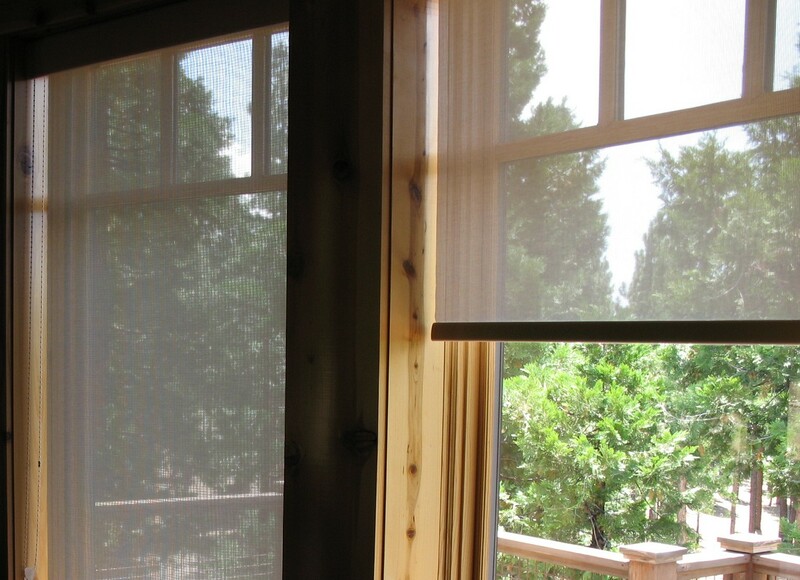 In areas of the house where privacy is a concern, solar shades may not be your best choice. As these photos clearly show, unless you make them wider than the window and mount them on the outside, you will be able to see around them at the edges. At night, when the lights are on inside, you can see right in from the outside. I live in the high desert of western Nevada. The sun here can be brutal. Most of the upscale residences and vacation homes in the nearby Lake Tahoe area have rooms full of windows situated so as to take advantage of spectacular mountain or lake views. Solar screens have proven to be a workable solution to the problem of how to protect from the high altitude sun without losing the high dollar views. I recommend them without hesitation.